This week the Horror Duo take on a pair of slasher films. 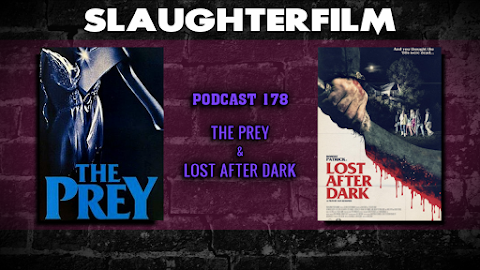 Forest reviews a film he despises, The Prey from the mid '80s. Cory takes a peek at Lost After Dark, a newer film set in the mid '80s. They also chat a little about the Friday the 13th terror attacks in France, Netflix Movie Night with their drunken friend -- Dr. Bork, and Cory witnesses an end of Ronda Rousey's undefeated streak. All this and a pig stands trial for murder. For more Slaughter Film news and reviews, as well as show notes and special events, make sure to visit our website; SlaughterFilm.com.